Caenlorn is a Bosmer commoner. He and his twin brother Maenlorn run The Flowing Bowl on the Anvil Dockside. While Maenlorn works 24 hours a day maintaining The Flowing Bowl, Caenlorn takes it easy in life and spends most of his time socializing with the regulars and welcoming new guests. He sleeps in one of the two guestrooms on the second floor until 10am then starts the day with a three-hour brunch downstairs. At 1pm, his behavior depends on the weather: if it is raining, he will simply stay at the Flowing Bowl; if not, he will enter Anvil through the dock gate and sit down on the bench next to Arvena Thelas until 5pm. At that time, he divides his time between the inn or wandering around on the dockside, this time ignoring the weather. Starting at 10pm he finally stays inside the Bowl, keeping his brother company until his late bedtime at 6am. Caenlorn wears a blue & green outfit with a pair of clogs. He carries a spare pair of breeches and a small amount of gold. If you approach Caenlorn while he is at The Flowing Bowl, he will welcome you: "Welcome to the Flowing Bowl. I'm Caenlorn, the one in blue. My twin Maenlorn is the brown one. Can we rent you a bed?" When you approach Caenlorn outside the tavern, he will ask you to guess who he is: "Okay. Guess who I am. Caenlorn? Or Maenlorn?" if you pick the option of Caenlorn, he will say "Right! The one in blue! You remembered." If you pick the option of Maenlorn, he will be quite disappointed: "Wrong! I'm the one in blue! Maenlorn is the one in brown." When asked about his city of choice, he will recommend a few of the local merchants: "Best shops in Anvil? Norbert Lelles handles rare books, exotic ingredients, and gems, and they have fine weapons at Morvayn's Peacemakers." 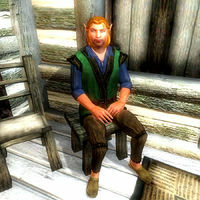 Although his brother offers the services, the townsfolk of Anvil will often include Caenlorn when talking about rumors: "Maenlorn and his brother run a nice establishment at the Flowing Bowl." and "I like the Flowing Bowl. Maenlorn and his brother are excellent hosts." Esta página foi modificada pela última vez à(s) 12h03min de 28 de março de 2015.